The day was sultry, if it was daytime. For a long period of time, we’d been trudging through the dense Komodo Forest, searching for the Hidden Shrine of Timikta, yet there were no signs of the shrine of its reptilian caretakers. The normal signs of lizardfolk presence were gone: crude tools scattered about, crocodiles peering from the dirty water, and constant hissing. Had they disappeared since Pearl’s last visit? Did something chase them away? Or, possibly the scariest prospect, did they know we were coming? I didn’t understand lizardfolk; I’d never encountered one in the wild, I’d only heard tales and spoke with survivors about their markings. If I had done more research, I would have known then that my final prospect was true; and thusly saved the lives of Pearl, Corrin, and Jeremiah. I’ll never step into those accursed reptilians’ disguised trap again. More dungeon masters (and players) should use and play lizardfolk. These scaly creatures are alien but familiar; most of the time, their society is strange to any of the PCs exploring their territory or delving into their lairs, but the players themselves are familiar with the concept of “the lizard person.” This makes them perfect villains to pit against your group. In this installment of Musing Over Monsters, we’re diving into the swamps and bogs rife with the reptilian lizardfolk. Within, their history, uses, homebrew capabilities, and even a short encounter with them awaits. Let’s roll. The concept of a humanoid lizard dates back to the original novels of the creator of Conan the Barbarian, Robert E. Howard. He called them serpent men, creatures with reptilian heads, scaly hide, and the bodies of humans. This quickly evolved from simple, fictional tales into the real world, and lizard men became the centerpiece of many conspiracy theories. From there, the race found its way to the world of DUNGEONS & DRAGONS, in the first, true supplement to the game: Greyhawk. Thereafter, the monster appeared in every premier Monster Manual, either as lizard men or lizardfolk. Much of their lore has remained unchanged through the editions. They are cold-blooded, tribal reptilians who resemble lizardly humans. Their scales range from green to brown, officially, but I love to scale my lizardfolk with rich blues and vibrant oranges. Their demeanor is alien; they don’t feel or think like regular creatures. 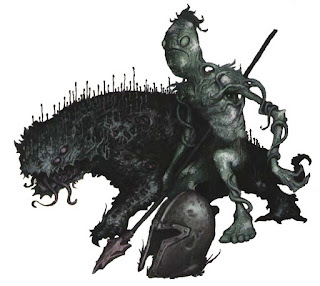 Instead, they simply look at things in black, factual terms: The example often used is that a human is scared of a troll because it is dangerous, but a lizardfolk simply understands that a troll is dangerous, and will fight if it think it can win, or run if it thinks it can’t. This can lead to lizardfolk being malicious and simple villains, but we’ll talk about that later. In earlier editions, their societies, tribes, were usually headed by a male, strong lizardfolk who had shamans advise him, but rarely lead. Simply put: The strongest lizardfolk ruled the tribe. 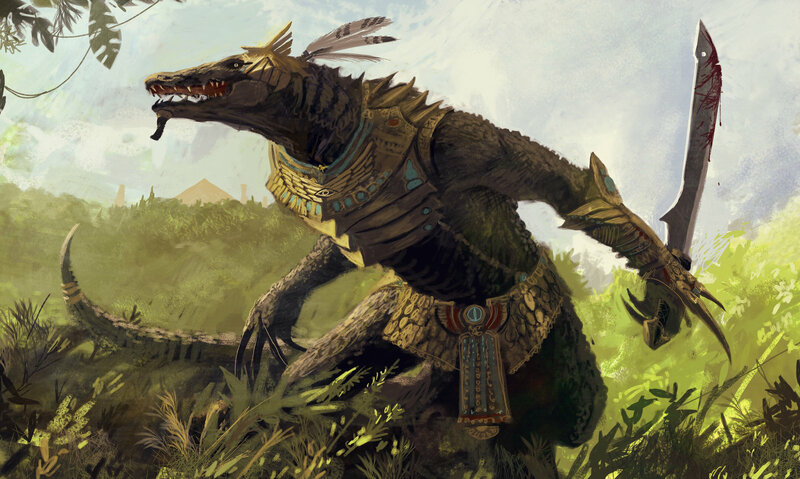 Fifth edition changed this to shamans leading the tribes, and, sometimes powerful lizardfolk blessed by Sess’inek, a “reptilian demon lord who seeks to corrupt and control the lizardfolk.” Lizardfolk are fond of utilizing traps, ambushes, and amphibian warfare when risking combat with other creatures. They are truly neutral creatures, mostly staying to themselves, hurting only those who enter their territory, and keeping promises to the people they’ve allied with. However, it is important to note that lizardfolk absolutely love the taste of humanoid flesh, which just might outweigh their dedication to their alliances in times of strife. All of these aspects offer great uses for Dungeon Masters, and, I suppose, for players as well. 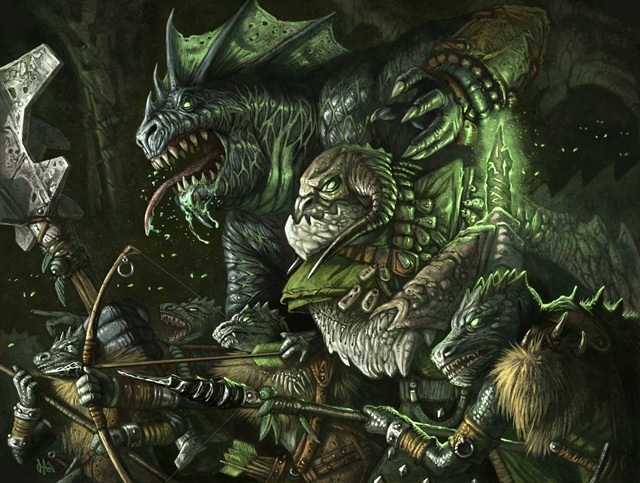 From fanatical cultists and cold killers to outcast warriors and quiet wizards, lizardfolk can be used as both as a tool of Dungeon Masters and players. First, let’s peer into how a DM can utilize them. Local Threat: Four “courageous” villagers went on a hunt in the nearby swamp and came out with a monstrous crocodile corpse. This was the pet of the local lizardfolk chieftain, who’s determined to avenge his deceased hunting companion by killing the most valuable hunter in the village. 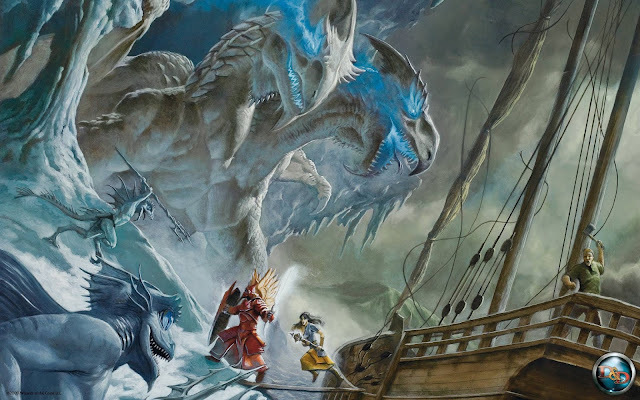 Regional Threat: A legendary archfey cyclops called the Beast Queen enthralled a lizardfolk tribe when one of her blessed fey crocodiles consumed the tribe’s lizard king and brought him to the Feywild. 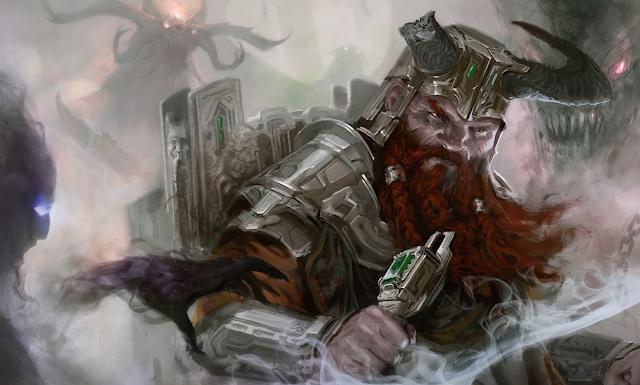 The lizard king became a warlock of the Beast Queen on one condition: He commands his tribe to conquer the entire forest realm for her, and then construct a portal to the Feywild. National Threat: A massive, accursed bog outside the bounds of a human nation houses dozens of lizardfolk tribes that have always kept each other busy with infighting and conflict. However, this changes and the nation is threatened when an adult green dragon named Galaphyss unites the tribes under one banner for one purpose: To drown the human nation into the great bog. Planar Threat: The daughter of the reptilian demon lord, Sess’inek, is born on the Material Plane. Her only goal is to see her father walk the swamps, bogs, and marshes of her home plane, and she’ll stop at nothing to see it through. She has the powers of a demon, the mind of a demon, and the passion of a demon, but the body of a typical lizardfolk. How quickly can she mass the knowledge and necessary materials to summon her father? Onto friendly lizardfolk, like allies and player characters. 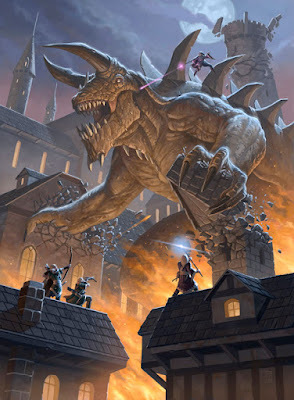 Lizardfolk allies can make for fantastic guides through difficult-to-navigate terrain, strange and quippy friends, and even stone-cold killers that are fighting with the party for the “right” reason. Remember, lizardfolk keep promises made, and will fight alongside those who have their best interests in mind; alas, as soon as those two propositions become false, the lizardfolk will most likely leave the party’s side. Lizardfolk player characters can be interesting to play. Usually, lizardfolk are unable to communicate effectively with other peoples because of their inability to feel “human” emotions. However, over time, perhaps your lizardfolk PC can develop these emotions and come to care for his compatriots; it’d be a compelling arc. Or, he could only be alongside the party to further his own gains, whether they’re malign or benign. Quick plug: In addition to my Musing Over Monsters series, I’m writing another series called The Worldforge. 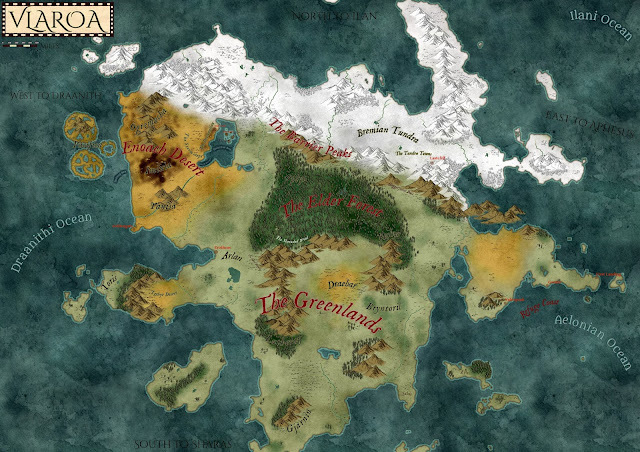 These articles go over the creation of a setting from the beginning and I’m using my own world, Aphesus, as an example. To add more depth to my world, and perhaps give you inspiration for your own, let’s give Aphesus’ lizardfolk a dash of flavor. I’ll admit this straight away: Lots of the peoples in my world are based on real-world civilizations and cultures with a twist. The lizardfolk of Aphesus are based on the Inca civilization, which was a South American people the ruled over a large swath of land on either side of the Andean Mountains. For my lizardfolk, I use Inca names and twists on Inca myths for my lizardfolk’s own myths and, at times, true stories. Doing this leads to easily finding names for lizardfolk villages, villains, and gods. On top of this, the scales of my lizardfolk can be any color from the rainbow, from blue and yellow to green and violet; why limit them to only being green to brown? I’ve also decided to incorporate a few different varieties, like dart lizardfolk and giash lizardfolk. 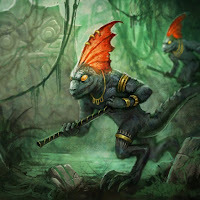 Dart lizardfolk are incredibly tiny, two to three feet tall, look like chameleons, have the inherent camouflage ability of chameleons, and usually live in tropical rainforests. Giash lizardfolk are huge and aquatic. On average, a giash lizardfolk is 11 feet tall and lives at the bottom of the sea of ocean near a coast. I’ll probably add more varieties as Aphesus grows, but this is more than enough for now. To close out my version of lizardfolk, they believe that when the dragons killed their deities, they reincarnated into lizardfolk in the Mortal World. This is true - but the deities are scattered across the world and some are in hiding for fear of punishment from the dragons. However, this leads to a variety of hijinks and lies inside lizardfolk culture. 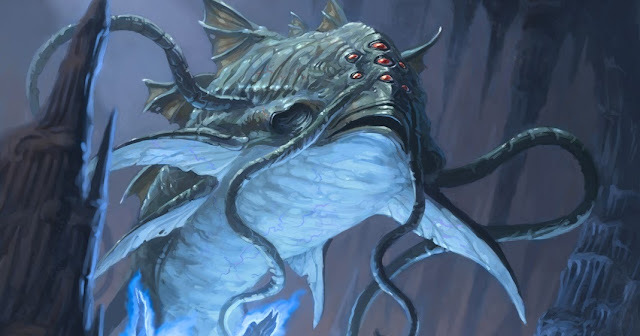 A powerful lizardfolk warlock, druid, or warrior might rise up and claim he or she is Awkawchak reincarnated...when that couldn’t be farther from the truth. 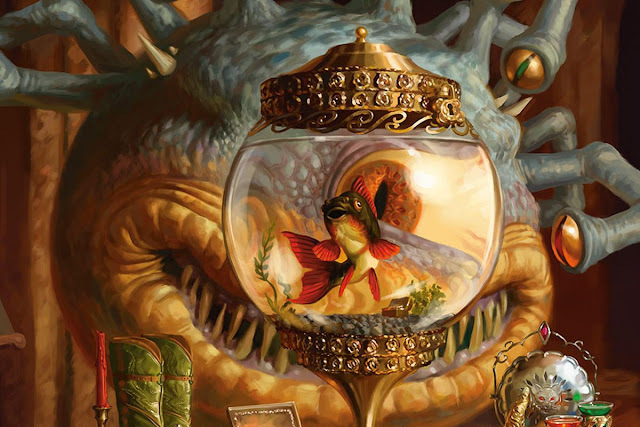 The first lizardfolk appeared in D&D’s premier edition and have appeared in every edition since. 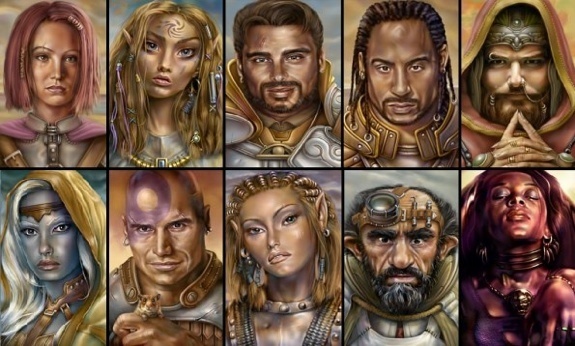 They became a playable race in AD&D 1E. 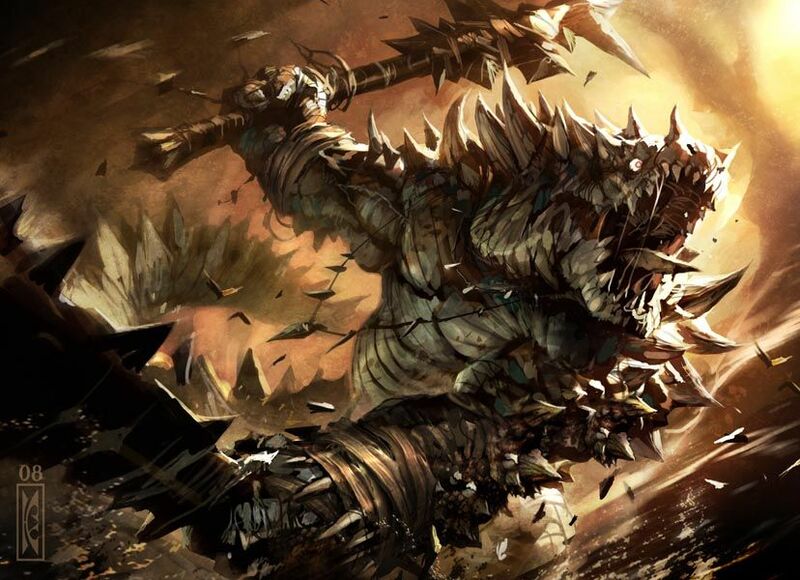 Lizardfolk can serve as capable villains and powerful player characters or allies. Their unique demeanor and view of life give those portraying the reptilians plenty to work with. Basing lizardfolk culture on real-world cultures with a twist can make for a compelling, special version of the creature in your setting. Don’t be afraid to make different subraces or strands of the creature. Go wild! I hope you enjoyed the article! 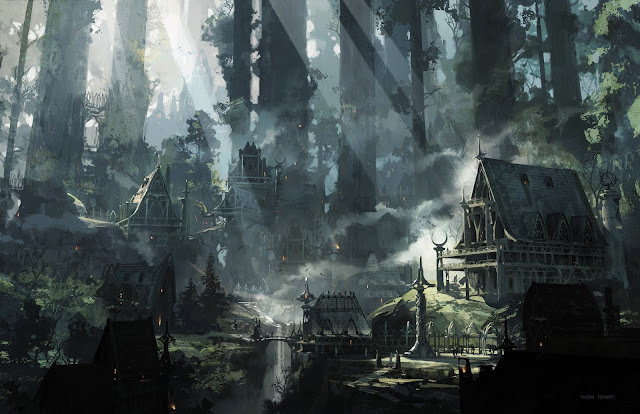 Next week, we’re returning to the Worldforge to discuss building a pantheon for your setting.